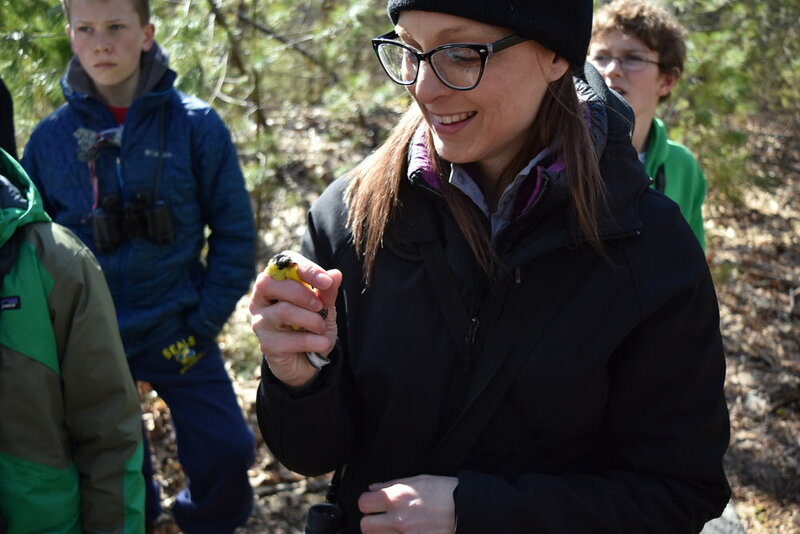 On Saturday, April 21st, five young birders came out to the University of New England to learn all about bird banding from Professor Noah Perlut. In short, we did not leave disappointed! 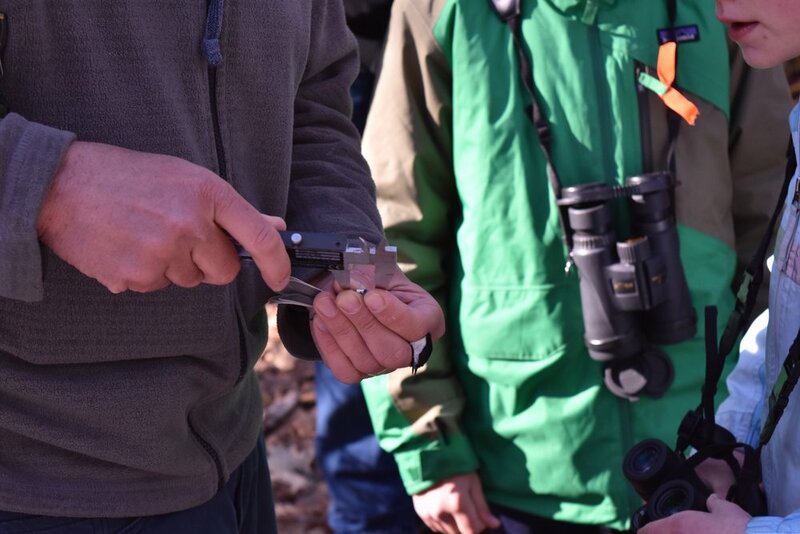 Dr. Perlut showed us exactly how birds are captured and banded, and he explained the importance of this practice for understanding and conserving birds. 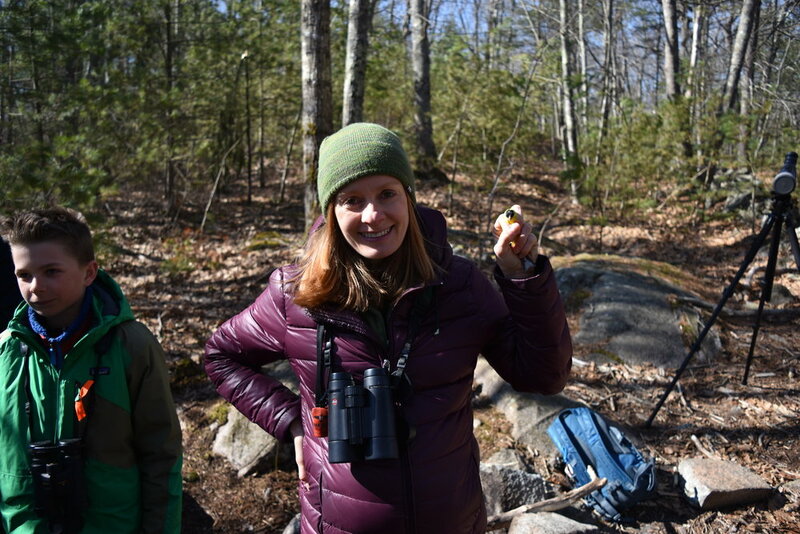 After banding birds, we visited the Department of Environmental Studies, where we got to see UNE's small but growing collection of avian specimens. We discussed the importance of museum collections and why bird skinning is a useful skill to have. Finally, we visited the new student commons building - the Ripich Commons - and learned all about bird-safe glass. Specifically, we talked about why it is essential to design window glass in a way that prevents birds from crashing into the glass and needlessly dying. All in all, our UNE trip was a very educational and inspiring experience! 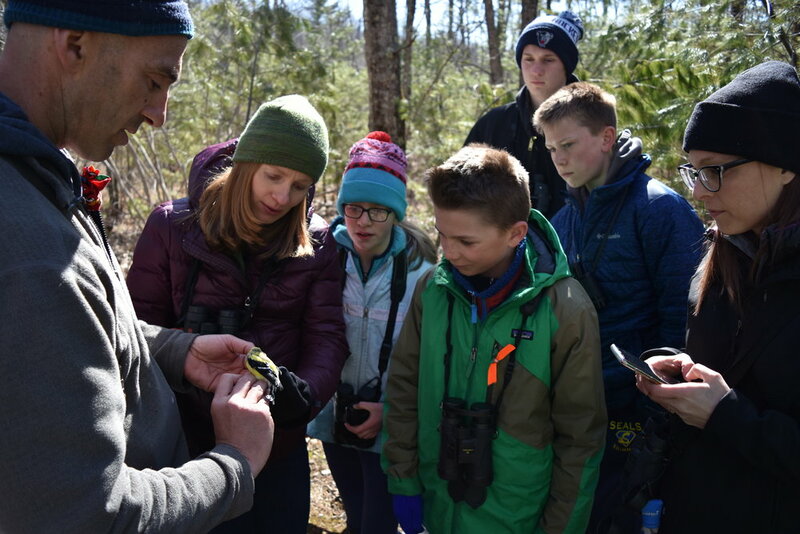 Many thanks to Dr. Perlut for generously volunteering his time, energy, and expertise to the Maine Young Birders Club on this day. We were all very grateful to spend the morning learning from him. There was a lot to talk about! 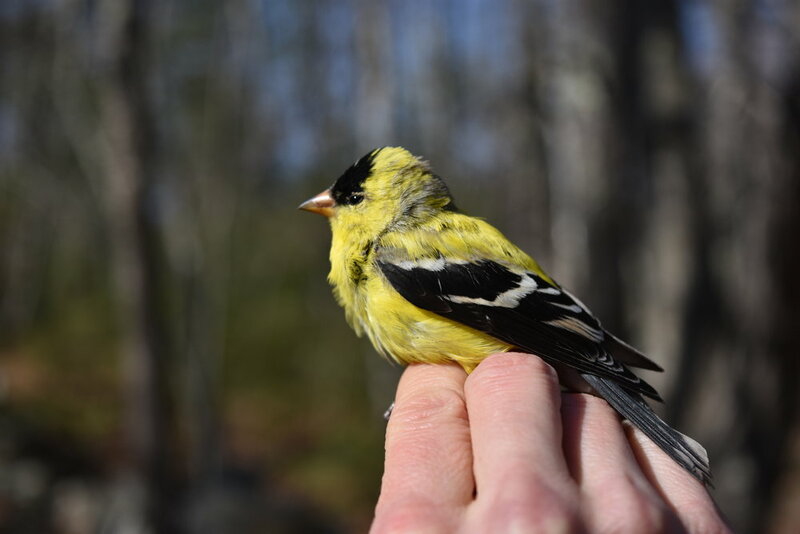 Exciting to band something other than a chickadee or goldfinch! 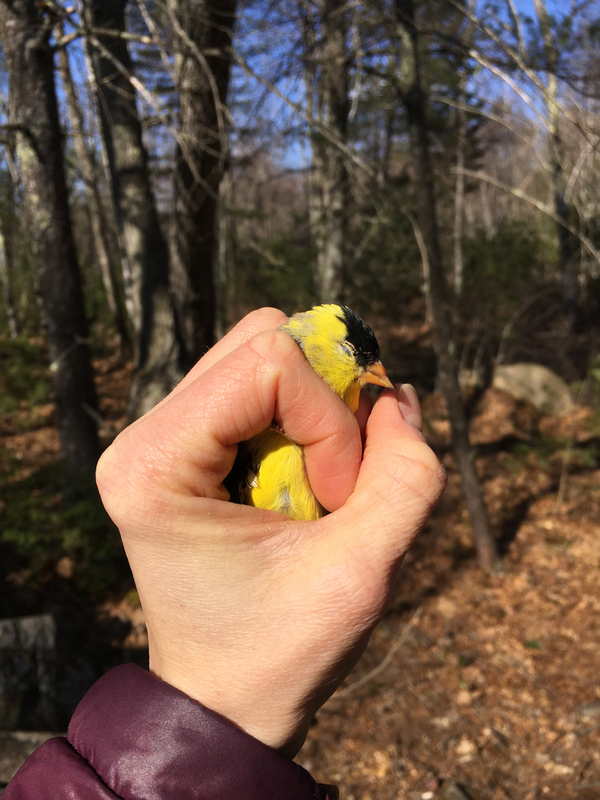 Who wouldn't smile getting to hold a goldfinch? Our newest young birder Albert picked a great first outing! 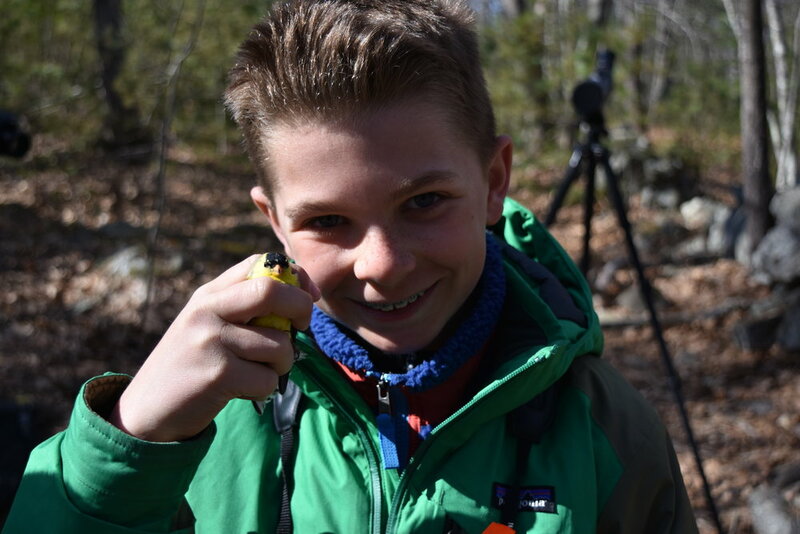 On Sunday, April 15, three young birders braved the icy roads and cold weather to join MYBC in the search for the American Woodcock, also amusingly known as the "timberdoodle" or "bog sucker." Lucky for us, we struck gold! Shortly after sunset, we arrived at a field in Kennebunkport, where we were greeted by a couple of recent arrivals: Hermit Thrush and Eastern Phoebe. We walked out onto the frozen field, which was coated in a crunchy layer of ice, stood still, and listened for the distinctive, nasal "peent!" of the woodcock. In a few minutes, we heard one off in the distance, followed by another one closer by. As the air grew darker around us, we heard the woodcock twittering high overhead as he performed his elaborate flight display. While he frolicked high above, we took this chance to approach his display turf by quickly jogging our way closer. Standing still under a large white pine, we held our breaths in the hope that he would land back on his favorite patch of field again. The woodcock did not disappoint. He descended, loudly chirping, and landed about 20 feet in front of us! Lena spotlighted him, and everyone got great looks through binoculars at the plump, peenting bird. The next time he shot off into the sky, we set up the scope and got in line, ready for better looks. Again, the male woodcock landed back on his favorite piece of earth, and Seth trained the scope on him as Lena kept the bird in the spotlight. One by one, each young birder got to relish incredible looks of this unique bird and admire his fabulous brown-mottled camouflage. Needless to say, we were all made very happy! Prior to our woodcock outing, we enjoyed a pizza dinner and dessert a la Anna. (Anna baked us cupcakes and served them with berry frosting and blackberries on top. YUM! Thank you so much, Anna, for the delicious treats!) After dinner, we tested our birding know-how with The Great North American Bird Watching Trivia Game. Some questions were very challenging and sure stumped us, but we certainly learned more about birds in the process. We also played Bird Bingo and enjoyed learning about various birds outside the US, such as the Shoebill, Blue Coua, and Superb Lyrebird. We watched a great David Attenborough video about the latter and were highly amused by the lyrebird's ability to mimic camera clicks and chainsaws. Anna also told us about the lyre in Greek mythology... about how Hermes invented this instrument from a turtle's shell and later gave it to Apollo. So yes - everyone went away with more knowledge and good entertainment this evening. One last bird highlight of note: just before sunset, at around 6:45 pm, Brendan yelled out, "Great Blue Herons!" We all looked out the window, and to our great surprise, we saw 18 Great Blue Herons rise up out of the marsh from behind the UNE soccer field along Hills Beach Road. The herons proceeded to soar around in one giant flock like vultures! It was an amazing sight... Lena and Seth said that they had seen lots of Great Blue Herons at rookeries before but never in a soaring flock like that, so it was very cool. Perhaps this was a group of migrants returning together? It was certainly odd to see them all soaring in a large flock up in the sky like that. We will now need to look into the migratory behaviors of Great Blue Herons to learn more. Nice spotting, Brendan! Note: click on the hyperlinked names of the locations to access the eBird checklist for each spot. Today we headed to Cape Elizabeth and visited all its famed birding spots in a whirlwind tour. In the chill of morning, we first gathered at Dyer Point, where we enjoyed seeing fly-by Great Cormorants, close Red-breasted Mergansers, a couple of distant, chunky Razorbills zooming speedily over the rolling ocean, a Red-necked Grebe, and several sizable rafts of colorful Harlequin Ducks. A male King Eider was recently spotted at this location, and although we poured all our keen attention into scanning the waters for his lovely countenance, we sadly came up empty-handed, as the King was nowhere to be found. Next, we explored Two Lights State Park and were rewarded with good looks at the three species of scoter: White-winged, Surf, and Black. Although our walk through the brushy woods along the ocean was quiet and unproductive, we did see a couple of American Crows feeding on Staghorn Sumac berries, which was interesting to observe. Sumac berries are quite nutritious, containing vitamin C, protein, fiber, and generous amounts of the minerals potassium, calcium, magnesium, phosphorus. Perhaps this is why the crows were enjoying munching on them. Just as we piled into the cars to leave Two Lights, Brendan spotted a large bird soaring behind all the trees and asked, "Hey, what's that?" It was big and dark, but we weren't quite sure what it was because it was flying behind all the tree trunks, concealed from view. Suddenly, the bird rose up into the air, giving us great looks: a juvenile Bald Eagle! It was fun to get this good bird from inside the cars, only moments before we left. Great spotting, Brendan! As we drove to Strawberry Fields, we listened to the apropos Strawberry Fields Forever by the Beatles. We were hoping to find some Cedar Waxwings or Snow Buntings here, but we had no such luck. Perhaps the windy morning kept these passerines down. We did, however, see a Northern Flicker, which was an unexpected treat. Afterwards, at Kettle Cove, we were rewarded by excellent, close looks at four Brant bobbing up and down in the water right along the shore. Unfortunately, our brief walk through the woods was ridiculously quiet and unproductive... alas, simply not a good day for passerines. At Crescent Beach State Park we had another Red-necked Grebe and 10 Great Black-backed Gulls who flew overhead in a loose flock. We were enjoying watching their contrasting black-and-white plumage from below, until we were interrupted by a loud Bell Boeing V-22 Osprey military aircraft that flushed all birds from its path, and us too. Birders flushed by an Osprey... who would have thought! Our penultimate destination was the Spurwink River crossing, where we hoped beyond hope to find a Short-eared Owl, but our timing wasn't right, since Short-eareds are crepuscular and prefer to be active during dawn and dusk. Perhaps we'll find this bird some other day. We scanned through over 80+ American Black Ducks at the marsh, and Seth's sharp eyes picked out a female Hooded Merganser and a beautiful male American Wigeon, which is considered a seasonal rarity! An alarmed American Crow also alerted us to a Red-tailed Hawk that few across the road and cooperatively perched up in an oak long enough for us to get nice looks through the scope. We ended our birding adventure back at Dyer Point, where we crossed our fingers for another chance of finding the King Eider. Several other birders were at the Point already, with the same intention. While scanning a distant raft of Common Eiders, Lena picked out the King, and pretty soon several others were on him, too. There was a flurry of scope searches for this less-than-cooperative, distant bird, who frequently dove or disappeared behind the swelling of the waves. After some time working on the eider, though, everyone came away with satisfied looks at this special lifer. We were getting ready to leave the Point when Ian cried out, "Wait, what's this gull? I think it's a white-wing!" Sure enough, an Iceland Gull flew past us, and we were grateful to Ian for spotting this pretty, cream-colored gull for us. What an eventful day indeed! 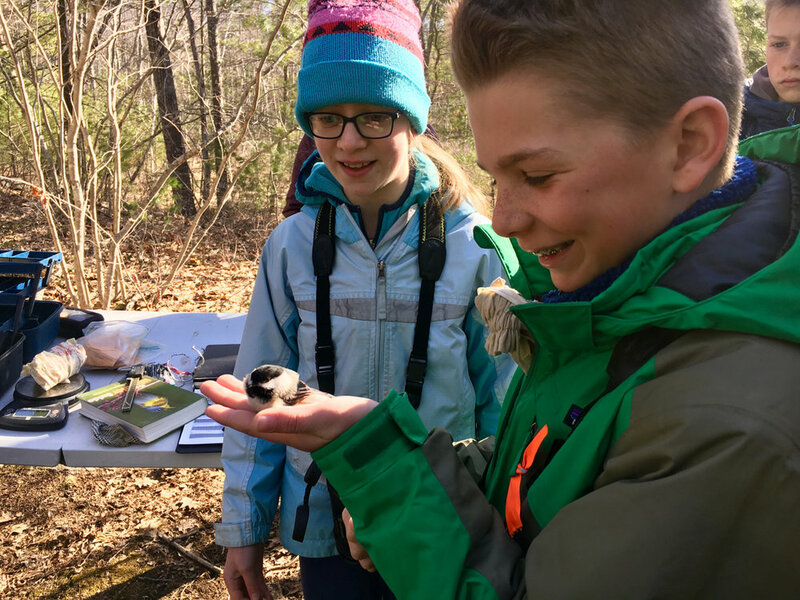 5 young birders joined count-leader Noah Perlut, Jonathan Alderfer (of National Geographic fame) and several others in participating in the 118th annual Christmas Bird Count (CBC) in the Greater Portland area. Our circle began early out at Scarborough Marsh. It was certainly a frigid morning, but despite the temperature, we walked the trail across from the Nature Center. As the sun rose, numerous groups "murders" of American Crows streamed across the the sky - leaving their nighttime roosts and heading out for the day. To our surprise there was a group "unkindness" of 15 Common Ravens among them... a new high count for this CBC area! We also got great views of American Black Ducks and Herring Gulls among others. We then moved down the road to the Eastern Trail where we spotted 2 Red-bellied Woodpeckers, one Belted Kingfisher, and a few Golden-crowned Kinglets above the Scarborough fowl (chicken coop :). As we walked down the trail where there was a group "hermitage" of Eastern Bluebirds followed by amazing looks at Snow Buntings, which Ian spotted, and some Red-breasted Mergansers in the alpen glow. As we moved further down the trail we came across a group "ascension" of Horned Larks which came in surprisingly close to us, and we got some distant views of Common Goldeneye and Hooded Mergansers. Continuing our circle, we moved to the Scarborough River Wildlife Sanctuary which was extremely quiet and unproductive save for a pair of Northern Cardinals, Tufted Titmice, and a White-breasted Nuthatch. There was a small group "ear-full" of Cedar Waxwings that flew over head. Moving on we stopped by briefly at Seaveys Landing where we saw a pair of Common Loons and a few Common Eiders. Another brief stop at Pelreco, which again was rather slow, but we did pick up a Red-tailed Hawk, our first raptor of the day! We wrapped up the trip with a walk to Pine Point beach where we had a couple of Red-throated Loons and Horned Grebes. 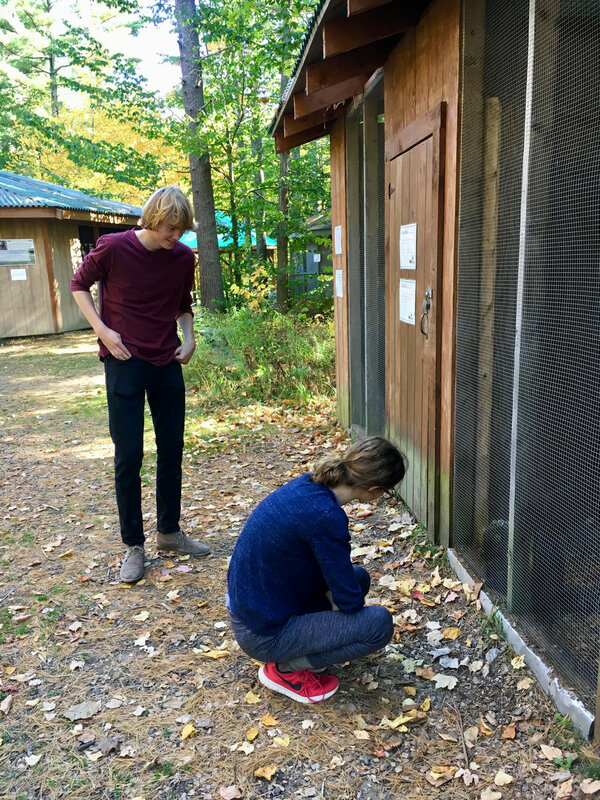 Two young birders, Anna and Andrew, made a full day of it by attending the compilation where all of the teams tally up how many birds they saw. 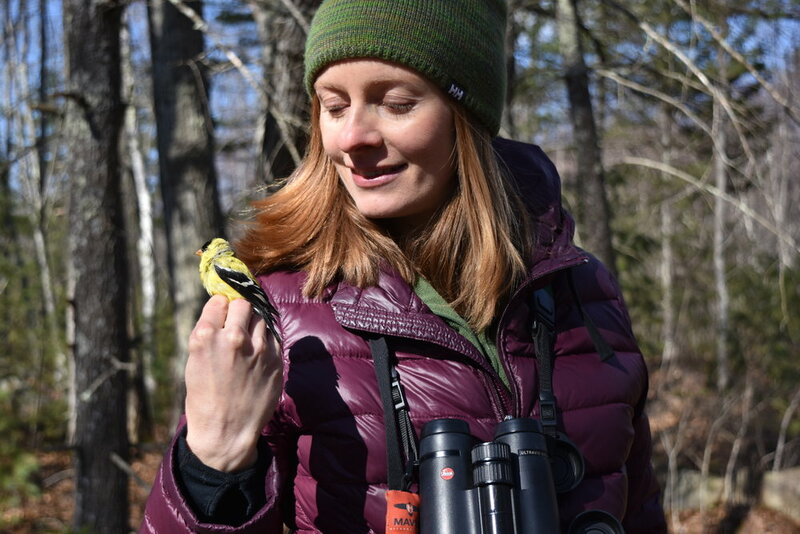 This is a very important part of this citizen science project, and over the years provides insight into the state of birds. It was a fun and educational day, and we hope to see everybody next year for the 119th CBC! On Sunday, November 12, five intrepid young birders gathered at the headquarters of Maine Audubon at Gilsland Farm on a very chilly (20-degree!) morning. We were joined by Jeremy Cluchey (Maine Audubon Communications Director) and Ari van den Akker (Staff Photographer). Jeremy and Ari will be writing an article about the MYBC, which is due to be published in the March 2018 newsletter Habitat. We are excited that word is spreading about MYBC! We were also joined by Maine Audubon's Staff Naturalist and birder-extraordinaire, Doug Hitchcox. He made this trip especially great thanks to his birding expertise, thorough knowledge of the local habitats, and sincere willingness to share his enthusiasm, time, and energy with our group. We started our bird walk at the pond, where we measured the thickness of pond ice and looked for muskrat dens along the banks. On our way to West Meadow, we spotted a distant group of crows harassing a hawk. Doug helped us identify it: Rough-legged Hawk! This was a lifer for most in the group, so we were thrilled to get scope looks at this uncommon visitor from the arctic. Also, a flock of a dozen Red-winged Blackbirds flew over our heads, and we briefly heard a flyover Snow Bunting, too. Most of our time was spent at the Presumpscot River Estuary, where we scanned the river and examined the ducks on the water. We saw large rafts of Common Goldeneye, Red-breasted Merganser, and Bufflehead, along with a few Common Eiders, Mallards, and American Black Ducks. Doug spotted a Red-throated Loon and Lesser Scaup for us (the latter was great to compare to the female goldeneyes around it). Ian kept trying to find a Barrow's Goldeneye in the group, and lo and behold, after some time, Doug says, "I have a Barrow's!" The strange thing is that it didn't look like a typical Barrows. The more we observed this bird, the more we noted how odd it was. Its head was peaked and had a bright purple sheen to it. Instead of a thin, white crescent on its face, it had a blobby triangle. The bird also lacked the black "spur" of plumage on the sides of the upper chest, and its upper body looked very white... much like the surrounding Common Goldeneyes. It only had thin lines of black across its wings. Very strange. Turns out this was a Common X Barrow's Goldeneye hybrid! We all thought this was very cool, though sadly it could not be added to our life lists because a hybrid does not count as a full species. We will have to start a new hybrid list instead! To warm ourselves, we took shelter from the cold in the Maine Audubon headquarters building, where we observed Black-capped Chickadees, American Tree Sparrows, and three species of rodents (Gray Squirrel, Red Squirrel, and Eastern Chipmunk) up-close and personal as they came to the feeders outside the Discovery Room. We also took a stab at a bird face ID quiz, which was a fun challenge! Continuing on, we walked from the Audubon center through a grove of Eastern Hemlocks, where we learned about the invasive wooly adelgid that's decimating hemlocks in the Northeast. We searched for owls roosting in the hemlocks but found a couple of squirrel nests instead ;). From there, we walked to the Community Garden and around back to the parking area along the road. We saw two Northern Flickers, a couple of aggressive Northern Mockingbirds chasing each other, and a Red-tailed Hawk circling overhead. Overall, we are so happy we endured the cold and got to have such a great experience visiting the headquarters of Maine Audubon! Thanks again to Jeremy and Ari for accompanying us in order to write a story about our club. Also huge thanks to Doug Hitchcox for giving us so much of his time this morning.. your leadership and deep love of birding were inspiring and much appreciated by our group! Young birders tackle a bird ID quiz at the Maine Audubon headquarters at Gilsland Farm, Falmouth. Video by Doug Hitchcox. At the pond. Photo by Lena Moser. Up-close with a Black-capped Chickadee. At the pond. Photo by Lena Moser. Chickadee outside the window. At the pond. Photo by Lena Moser. Gear table. At the pond. Photo by Lena Moser. 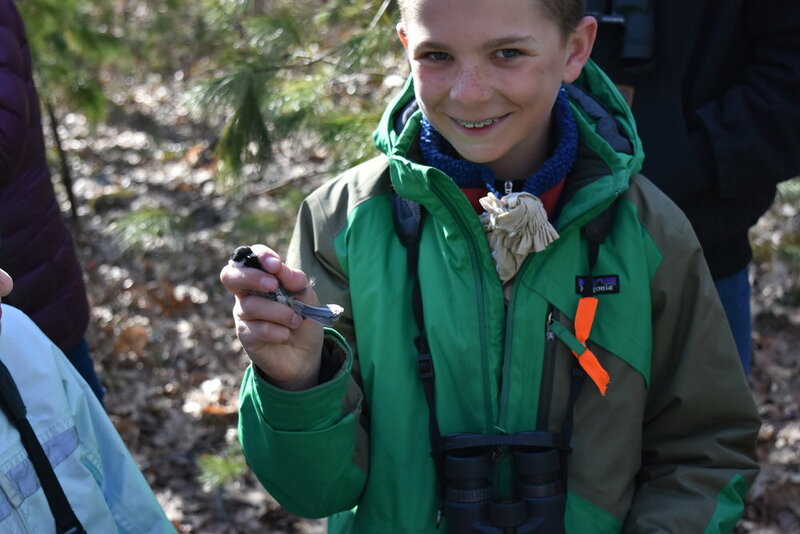 On Saturday, October 21st, two young birders led our team around Mt. Agamenticus and the Center for Wildlife, and we had a blast! Despite it being the tail end of fall migration and having slightly unfavorable winds, we had a pretty “birdy” day. Some of the highlights on the mountain included Red-bellied and Pileated Woodpeckers, a close interaction with a mixed flock of Black-capped Chickadees, Golden- and Ruby-crowned Kinglets, and a Brown Creeper. After hiking around, we came upon some fallen logs and decided to perch on them for a while. As we rested, we exchanged nature stories about our personally memorable encounters with wildlife. We left our mark on Mt. A in the form of some MYBC graffiti. (Don’t worry! We used pieces of charcoal that we found to draw the silhouettes of birds and tracks on some rocks. These will wash off in the rain soon.) We “topped” it all off with a hawk watch at the peak of Mt. A, where we spotted 12 Turkey Vultures and 5 Red-tailed Hawks. We then drove to the base of Mt. A. to the Center for Wildlife, where we did a self-guided tour. This was a fun experience, since we got close-up views of awesome wildlife like a Long-eared Owl, Merlin, Porcupine, and some Painted Turtles! We also learned about how the Center for Wildlife cares for sick and injured animals. (As we were walking around, we also had three Common Ravens fly overhead, croaking loudly.) Toward the end of the tour, one of the staff—Sarah Kern—was kind enough to bring out one of their ambassador Peregrine Falcons, Freyja, and she fed her a quail and a couple of mice. Watching this majestic falcon feed at such a close distance was simply incredible. Sarah shared with us a wealth of information about Peregrine Falcon ecology and behavior, and she answered our many questions. Thank you, Sarah, and the Center for Wildlife, for being the highlight of our day for all the hard work you do to help wildlife. Our full eBird list can be found here. 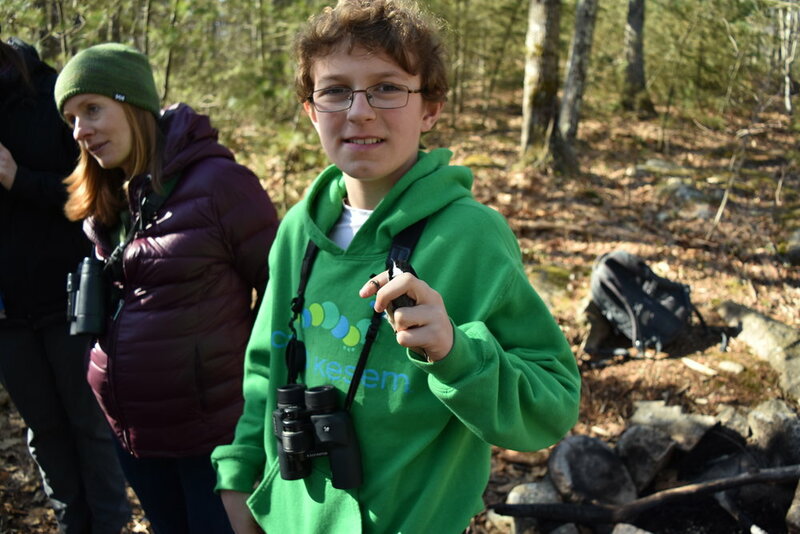 Thanks to our two young birders, Brendan and Anna, for making the day super fun and reminding us how a walk in the woods can be so rejuvenating and uplifting. Highlights included Sanderlings, Dunlin, Black-bellied Plovers, and a Short-billed Dowitcher on the Basket Island causeway at Hills Beach. A female Belted Kingfisher also put on a show, hovering in place for long periods of time as she honed in on the fish she wanted to catch in the tide pools below. Local birder Pat Sanborn pointed out a raft of nearby Green-winged Teal. We loved seeing their bright green specula (colorful secondary feathers) glistening in the sun. When we were done birding at Hills Beach, we relaxed and ate our lunches in the Park in the Pines as Cedar Waxwings serenaded us with their high-pitched calls. After the brief rest, though, we were eager to continue our shorebirding adventure. Next, we headed down Mile Stretch Road to South Point Sanctuary, where we were greeted by a flock of over 7 Black-and-white Warblers, a Magnolia Warbler, Red-eyed Vireo, American Redstart, and a loudly-calling Northern Flicker. Coming off the boardwalk, onto the beach, we scanned the rack of seaweeds for peeps and were grateful to birder Richard for helping us find the Western Sandpiper: a rare visitor that was a lifer for all the young birders! Of course, that made everyone's day. Fortunes Rocks Beach also rewarded us with great looks at a White-rumped Sandpiper and a couple of Laughing Gulls. Unfortunately, we also saw an injured Herring Gull with a broken/bloody wing... the sight of which made us all a bit sad because we knew this bird wasn't going to make it very long. Micah Pietraho spotted a Red-necked Grebe with his sharp eyes, and we had to work hard to get good looks at that bird because it preferred diving to swimming. We couldn't believe how many Northern Gannets were out on the ocean... we counted over 30, including a couple that flew in very close to shore. One individual floated on the water for a while, affording excellent scope views. A flock of White-winged Scoters flew past us quickly, but the large rafts of Common Eiders floated about lazily and were easy to enjoy. Before calling it a day, we stopped at Great Pond, where we saw a young Black-crowned Night-Heron and a sleeping male Wood Duck, who presented quite the identification puzzle at first. A good-sized flock of Snowy Egrets showed off their plumes as they preened in the trees, and a Spotted Sandpiper wobbled along the exposed mud bank. We found some ripe blackberries nearby and enjoyed a sweet treat to boot! 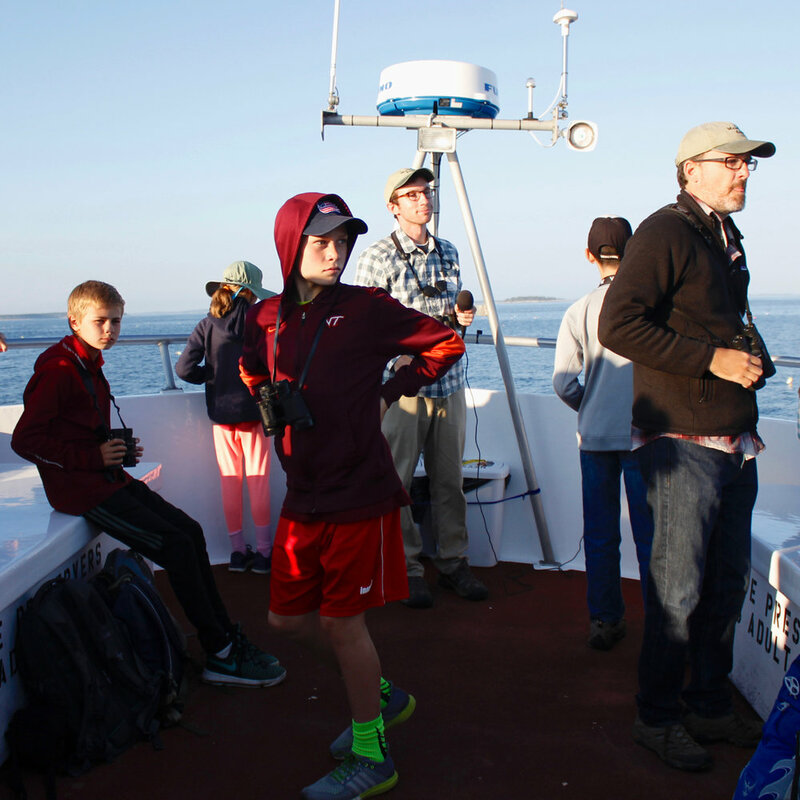 On Saturday, July 15th, seven young birders and their families set out on the Maine Audubon puffin cruise to Eastern Egg Rock. This tiny, 7-acre island is famous for being the most easily-accessible Maine island for observing nesting Atlantic Puffins. We were well-rewarded with fabulous looks at puffins up-close, including a couple that flew right over the boat! Laughing Gulls were abundant, as were Common Terns, though we picked out a few Roseate Terns, too. Other highlights were a Bonaparte's Gull, Bald Eagles, a young Northern Gannet, and some cool mammals like Harbor Porpoise and over one-hundred Harbor Seals! Everyone left the trip happy, especially since the puffin was a "lifer" (a first-time-seen) bird for many. 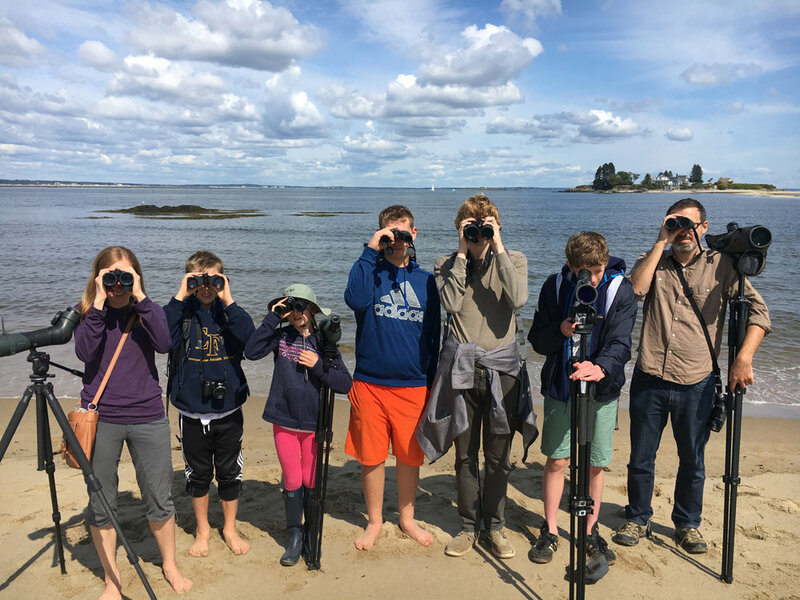 A big thank you to Maine Audubon for sponsoring this trip for the young birders and club coordinators. Also thanks to naturalist Doug Hitchcox for adeptly navigating children, parents, wildlife spotting, and announcing/interpreting - all at the same time! We appreciated his excellent leadership on this trip. The full eBird checklists for our trip can be found below. Photos by Lena Moser and Nathan Hall. The Sunset Puffin Cruise is aptly named!